I recently came back from a month-long trip to Turkey and Southeast Asia, and I managed to spend a week in my birth land, Malaysia, with my parents and relatives. This trip back was a great opportunity to catch up with my folks as well as to gorge myself with dishes that I missed most from my growing up years in this part of the world. After running around from one eating place to another and savoring the home dishes my Auntie Shirley cooked over the course of the week, here is the run down of the Malaysian gastronomic delights that not only sated my stomach but also warmed my soul. 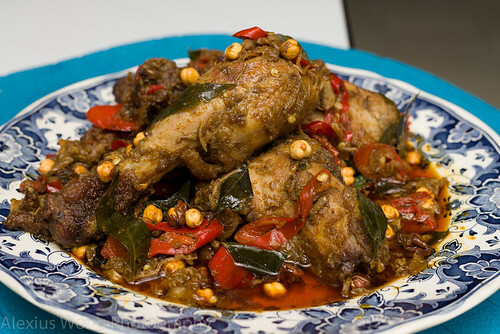 This posting is a continuation of the series on Malaysian Meals posted a couple of years ago (see blog links in above menu). Malaysians really love their breakfast, judging by the crowds in eating places including roadside stalls at the early hours. One item that they are very fond of is Soft-boiled Egg which you will find to be a common order. 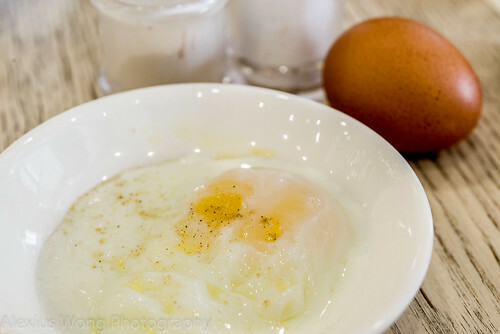 A whole egg has been poached to the perfect state of opaque egg white and a barely cooked viscous yolk. A touch of white pepper (not black) and some salt or soy sauce complete this simple yet satisfying starter. 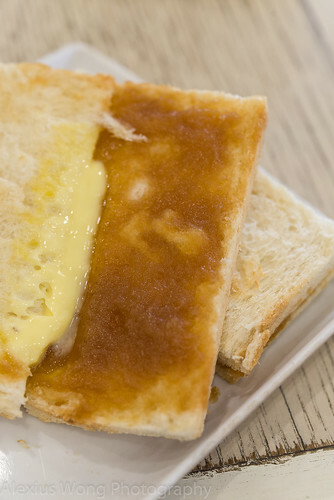 Usually, it comes with a side of Toasted Bread, cut from whole loaves and not presliced, toasted but still quite pale, slathered with some margarine (not butter – only time an exception for me here) and some Kaya, a sweet coconut jam. This sweet sandwich is perfect with some hot Teh Tarik (pulled tea) or the strong Kopi-O (Malaysian coffee) to wake the eater up with its rich sweetness. I didn’t mind ordering two eggs with toast morning after morning since they get it right in this part of the world, and concern for my cholesterol level went out of the window with each delicious bite. Another fairly mild breakfast item is Chee Cheong Fun. 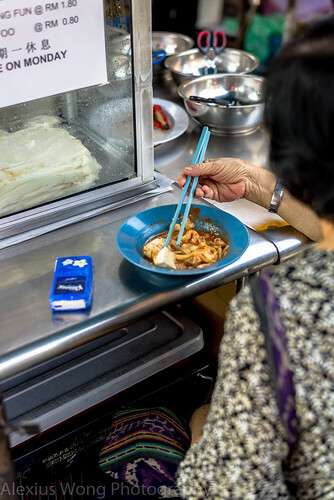 It is steamed sheets of rice dough rolled up to look like its moniker that translates as pig’s intestines noodle. No meat is involved here. It can be eaten with a combination of sweet and sour spicy sauces, and a sprinkling of toasted sesame seeds. 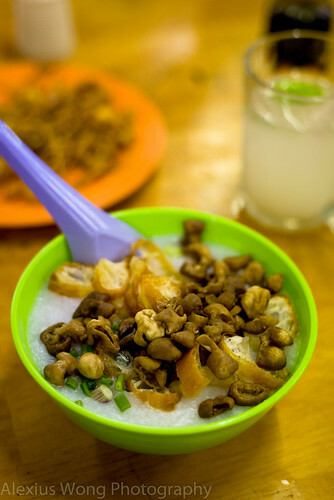 But most eaters would add a myriad of toppings called Yong Tau Foo. 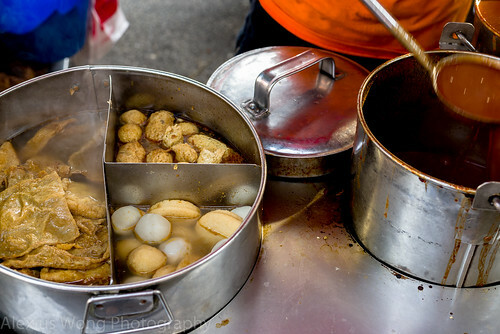 Stuffed tofu skin, fish ball, and stuffed puffed tofu cake are favored at this time of the morning. This was a favorite of mine when I used to visit my parents, and my Mum would stop by the stall during her rounds in the open wet markets, a place where great breakfast can be found. This Chinese breakfast item is also a noodle – Wanton Noodles in Sauce. Most of us know this dish as a noodle soup with floating pieces of wanton dumpling. Here, we have a version in which the cooked noodle is mixed in a sauce of soy, oyster sauce, and dark caramel soy sauce, a version that I rarely find outside of Malaysia. I prefer this type since it is not too hot for consumption in this sweltering part of the world, as well as its slight sweetness from the dark sauce and sour from some pickled green chilies. Customarily, a bowl of wanton soup is served with the noodles. But my parents usually add some other protein like Barbecue Pork (Char Siu) or my favorite, Braised Chicken Feet. Yumm. Another fairly mild Chinese breakfast item is Rice Porridge or Congee. Grains of rice have been cooked with lots of liquid until they have lost their structural integrity, resulting in a thick gruel much like loose oatmeal. Without anything else, this porridge tastes of nothing. Hence, the bowl I had in a hot steamy coffee shop was topped with fried dough crullers, slices of pork, and crispy fried pig intestine. The dough crullers and pork added the savory and textural elements to this bowl, as well the intestine bits that also imparted a touch of funkiness. Probably my mother’s instruction for the cook to add an extra serving of intestine was a bit overkill. But nevertheless, I enjoyed this porridge especially having not savored it in so many years. People in this part of world have been conditioned to seek spice in their food. Hence, there are some breakfast items that fit that bill. Roti Chanai and Murtabak are savory pancakes of South Indian origin, and their presence is indicative of the sizable Indian community here. The former is a simple grilled flaky pancake whereas the latter is the same pancake but with a stuffing of meat, egg or onion. For one breakfast, I chose the egg and onion version. 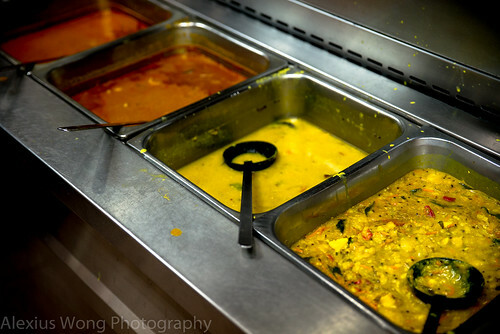 The spicy element can be found in the different sauces that accompany this rather mild dough: fish curry, dahl lentil curry, and Sambar (a sour spicy sauce). It is not uncommon to find a Malaysian tearing off pieces of the roti or murtabak with their fingers and dipping it into the various sauces. No matter the cultural background, all Malaysians love this breakfast, as far as I know, with no exceptions coming to mind. 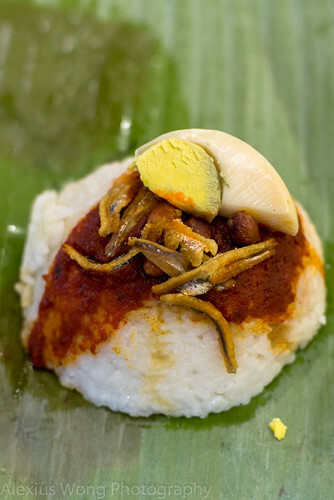 Another spicy breakfast standard is from the Malay culture – Nasi Lemak. Its name refers to the rice that has been cooked with coconut cream to elevate the starch with some richness and fragrance. The usual toppings are crispy Whitebait fish, roasted peanuts, a hard-boiled egg, and sweet spicy Sambal sauce. The banana leaf wrapping is traditional and commonly seen, lending some vegetal fragrance to the whole mix. I have eaten versions with curry chicken and beef rendang. But I prefer mine pared down to its bare simplicity and devoid of meat, like the above, especially at the early hours of the day. 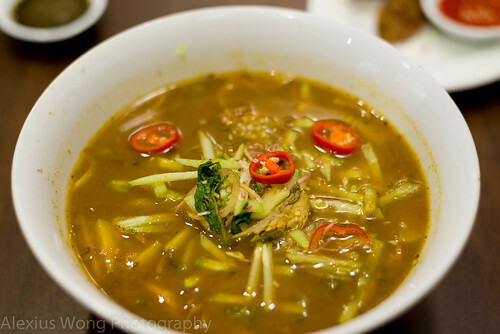 For lunch, Malaysians tend to gear towards noodle dishes. The following dishes are from the Baba Nyonya /Peranakan culture which I belong to. 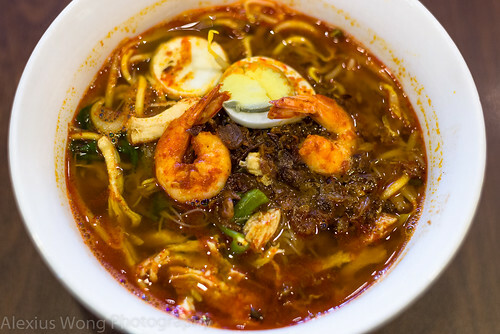 Penang Shrimp Noodle Soup is a dish with noodles in a spicy stock bursting with shrimp flavor as a result of frying the shells before making the stock. Pieces of chicken, shrimp, egg, and fried shallots complement the rich broth as well as adding some protein. As if it were not spicy enough, a side of cooked chili paste is usually added to each chopstickful of noodles. An appetizer ordered that day was Lor Bak. Tofu sheets have been stuffed with a mixture of minced meat and shrimp along with the secret ingredient, five-spice powder. The side of sour chili sauce is de rigueur with its chili heat as well as acid to balance these rich meaty bites..
Again, the following lunch dishes are from the same culture as above. 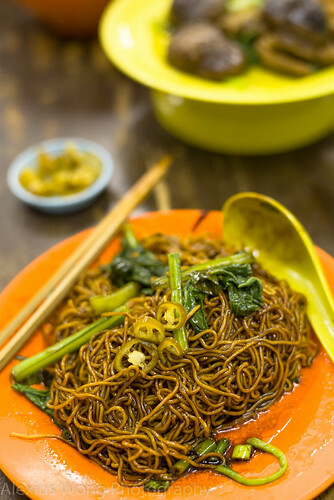 Asam Mee is also from the Penang region, pointing to the Siamese influence with the use of sour elements. A spicy tamarind broth has been cooked with various root aromatics and Mackerel fish to produce a flavorful broth that is key to this dish. Toppings of cucumber, lettuce, pineapple, raw onions, mint, and fresh chili result in a melange of textures, temperatures, and flavors, making this dish a must-have in my books. A side order of Kueh Pai Tee brought back memories of eating them with my grandmothers. 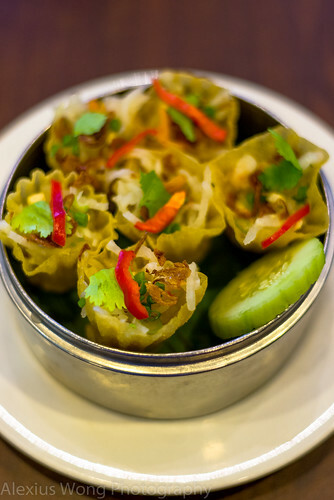 Fried dough shells looking like top hats, hence its other moniker, have been stuffed with a savory mix of jicama and meat, and topped with egg, fried shallots, sometimes crab meat, cilantro, fried shallots, and a dollop of sour chili sauce. Rarely is one stuffed shell fulfilling, but I had to make room for the above noodle dish. Another Penang Nyonya dish I ate was Mee Siam that was cooked by my Aunt Shirley. This recipe was handed down by my maternal grandmother, and I requested my aunt to cook it because I missed it very much and I wanted to fine-tune the recipe I copied down years ago. Rice stick noodles have been stir-fried in a chili-shallot-garlic-dried shrimp mix before tossed with shrimp, bean sprouts and Chinese chives. 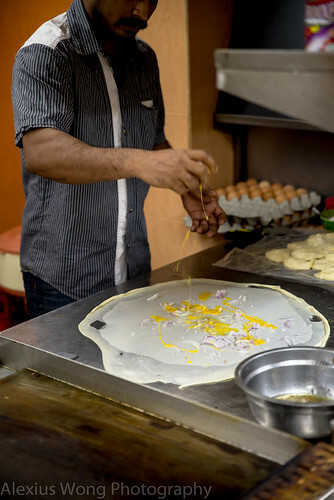 The usual toppings are slivers of egg pancake, fried shallots, fried garlic, sweet chili paste, and fresh lime juice. A sweet fermented bean paste sauce is added according to the diner’s whim. As you can see the preparation list is quite long, hence, no other dish is cooked or served along this monumental dish. 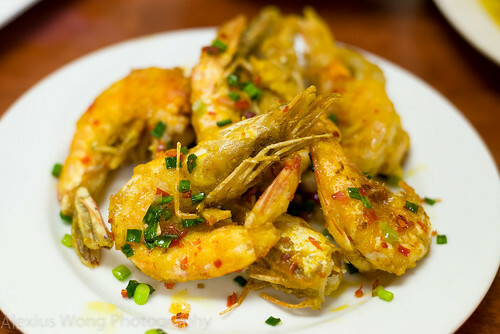 The result is a delight of sour, sweet, spice, and salty, as well as the different fragrant elements from the dried shrimp, chives, fried shallots and fried garlic. With such a wonderful dish, there is never a request for anything else but more of this heavenly treat. 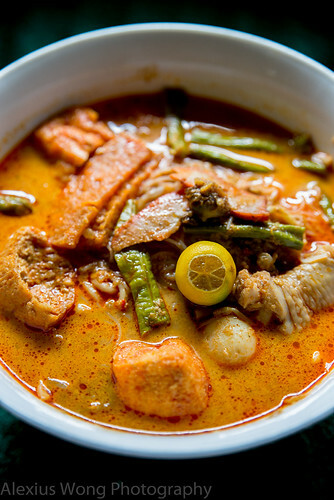 This Nyonya noodle dish, Curry Laksa, is from the Malacca region, which my father’s side hails from. 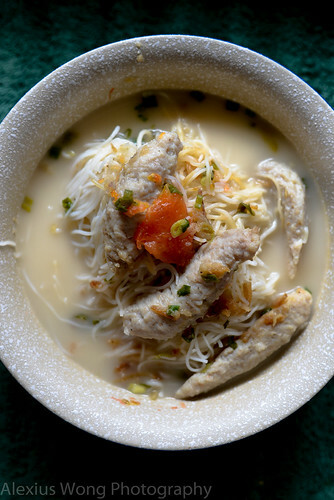 Noodles are covered with a rich broth make with chili, root aromatics, and enriched with coconut milk. The usual bowl partners are chicken, fish cake, tofu cakes, fish ball, bean sprouts and some long beans. A squirt of lime juice is the necessary citrus hit to cut through the creamy broth. Not only is this bowl filling with all the different elements, but truly satisfying with the strong flavors and the rich coconut based soup. Not an everyday lunch order, but worthwhile once in a while. A road stall lunch order one day was Minced Fish Noodle. This is a take on the traditional fish ball noodle soup dish. But here we have a version that is made with a sweet fish bone broth that is made even sweeter with tomatoes and cloudy with evaporated milk, which was completely novel for me. The fish cake was not the usual bouncy fish ball consistency that I was used to, but one that was rather airy and light with the slightly rough texture from fish meat that had not been overly minced. The soft rice stick noodles was the right starch to go with this delicate dish, which was a nice break from all the spice. A mild noodle dish but not tame after all. 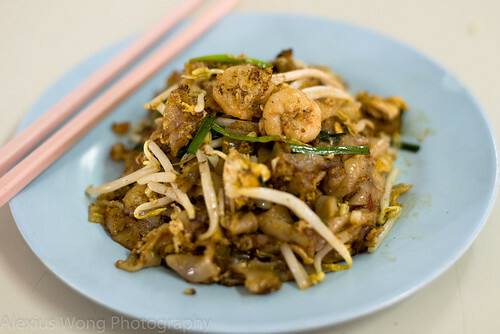 The last noodle dish is usually served in coffee shops or roadside stalls – Char Kueh Teow. 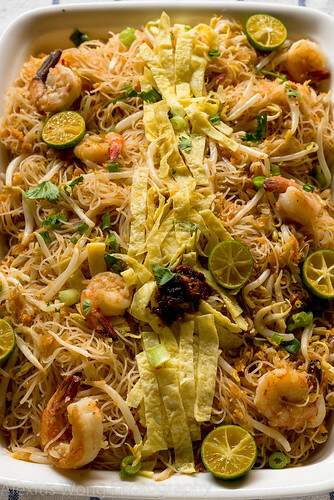 Flat rice noodles are wok-fried with a dark sauce, shrimp, sometimes Chinese sausage, bean sprouts, egg, and usually cockles. This dish is difficult to replicate at home due to the high temperature needed to char the noodles slightly to give that je ne sais quoi. However, as of late, I have been rather disappointed by stalls that take short cuts with the ingredients, like cockles and crispy pork lard, and the lack of wok char from cooking it at a lower temperature. To make matters worse, I have not found any cook in the city using pork lard as the starting element, which imparts lots of flavor to each bite. Another favorite of mine, but I’m easily disappointed by what is served. Oh well, the quest continues. For dinner one night, my parents and I had Hainanese Chicken Rice. A whole chicken is gently cooked in which the collagen in the flesh is still intact, producing a silky smooth and moist flesh. The rice is cooked with the broth and some chicken fat, tasting savory from the liquid and rich from the fat, good enough to be eaten by itself. 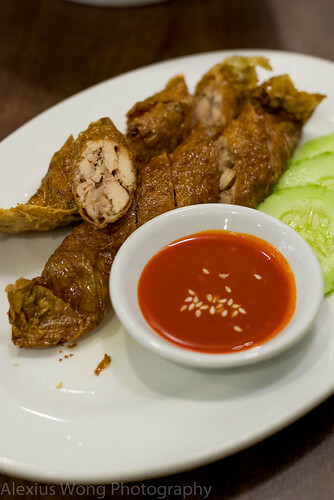 The chicken in this order was from the “kampung”, a free-range bird that was nearly devoid of fat and tasting far superior than the supermarket kind. The side of ginger chili sauce is the obligatory sauce with the poultry. 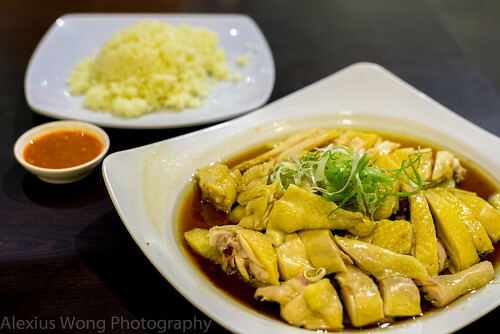 An order of Ipoh Bean sprouts was the perfect accompaniment to the mild-tasting Chicken Rice. Bean sprouts have been stir-fried with slivers of salted fish that have been made crispy by frying in very hot oil, imparting its fishy saltiness to the rather tasteless sprouts. 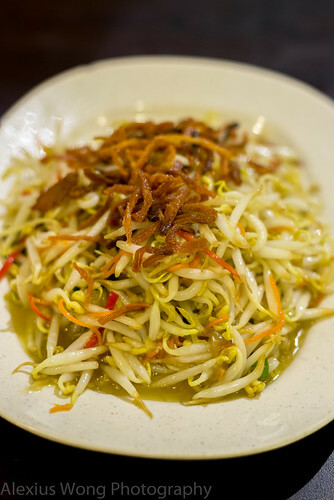 What makes these bean sprouts unique is its short length and its distinctive flavor from the lime water in the Ipoh region. Our order was quite late in arrival, but it was worth ingesting every morsel indeed. A meet-up with a former schoolmate from my English days warranted feasting on what Malaysian cuisine is also known for – seafood. The first order was Frog Legs (water animal, right?) which was cooked with ginger and green onions. The sweet flesh was paired well with the pungent ginger and green onion and brought together by a light sauce. Another dish was Crispy Shrimp. Large pieces of the shellfish were fried in very hot oil until the shell was brittle and edible while the flesh remained moist. A light coating of fried fresh chilies and green onions provided additional flavors to these tasty pieces. 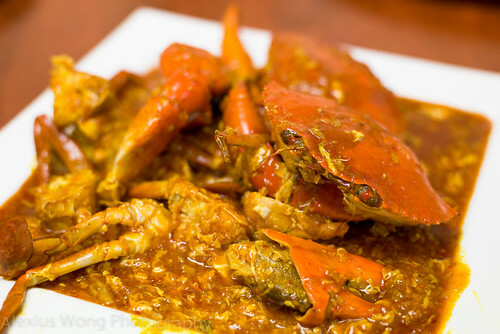 The final dish was Chili Crab, a perennial favorite of most Malaysians. Large pieces of fresh crab were coated with a thick sweet chili sauce that was enriched by some egg. The idea is to lick the sauce off the shells, crack them open to dip the flesh in the sauce, and to dunk pieces of toast into that heavenly sauce. Yes, that sauce is good enough to lick off the plate, making it a hot item on the menu. A lunch meet-up with some relatives was regaled with a couple of Chinese classics. The first was Braised Pork Knuckle. 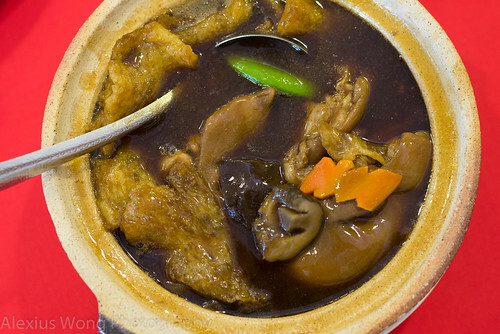 Pieces of pig hand or feet have been stewed in a dark savory sauce for hours before being paired with some fresh vegetables and Chinese mushrooms. 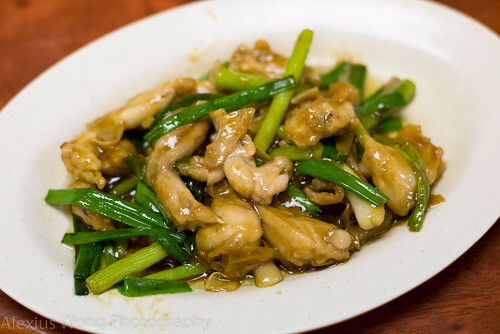 What I enjoyed was the tender pieces of pork that has been stewed long enough for it to become fork-tender and full of flavor, as well as the chewy pieces of fish maw that I found quite interesting texture and taste-wise. 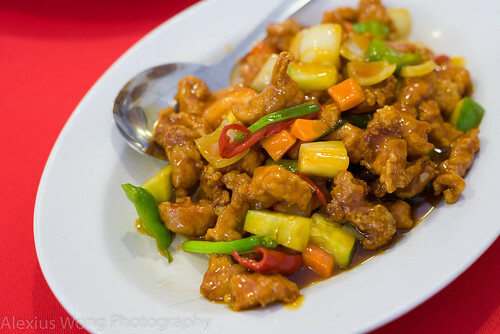 The other classic was Sweet and Sour Pork. Eating it was refreshing for this diner, a far departure from the usual renditions found in inferior establishments. Here was a dish made with small pieces of pork that were not too heavily battered, paired with pieces of fresh cucumber, green onions, onions, pineapple, and red chilies, and brought together by a thin sweet and sour sauce that was not nuclear-glowing by red coloring. When done right, this dish is worth ordering and revelatory to anyone. Staying with my auntie, I requested a couple of vegetable-based dishes that I had not eaten for quite some time. 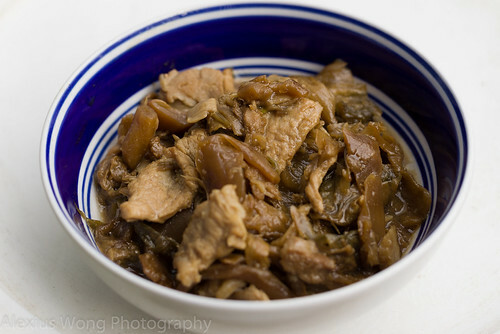 Chow Moo Choy is made with pickled vegetables cooked with pieces of pork. The leafy vegetable has been dried with salt and sugar, and these same flavor elements permeate the whole dish, making it quite irresistible. The other is Chah Choy. 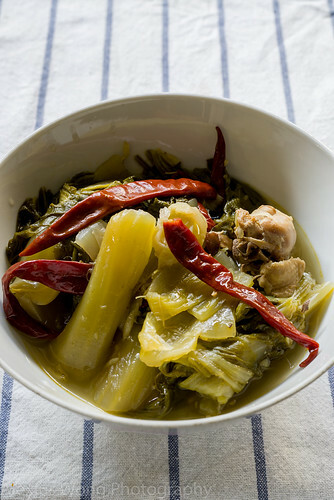 Fresh cabbage-like leaves are cooked with leftover chicken or pork, whole dried chilies and tamarind slices until the leaves are very tender, tasting savory, spicy and sour at the same time. I had missed these two dishes, and I am grateful that my auntie went out of her way to bring back these dishes to my taste buds. A couple of dishes that I ate on this trip reminded me of my grandmother and her cooking. 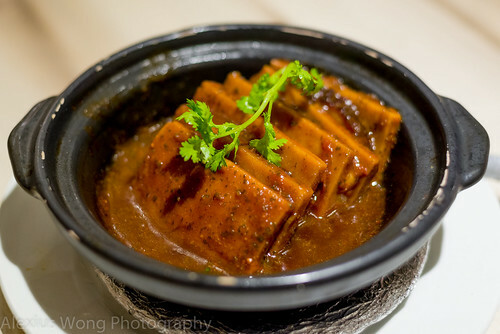 Kow Yoke is a braised dish with alternate layers of taro root and pork belly covered by a thick sauce. The melting quality of the dish evokes a sense of comfort while elevated by the five-spice in the sauce. This was definitely a dish that I missed dearly. The final dish that the same auntie cooked for my parents and me was Ayam Kacang Putih. This Indian recipe was handed down from my grandmother’s sister after having learned it from her father-in-law’s Indian chauffeur. Here, pieces of chicken have been marinated in red chili powder before being fried and paired with fragrant curry leaves, perfumy anise powder, red chili, shallots, and crunchy roasted baby garbanzo/chick peas. This dish is a definite explosion of flavors that brings back memories of Grandma cooking this signature dish. Again, this was a trip down Memory Lane that was worth every chicken morsel and every drop of the sauce. Whew, that was only part of what I consumed in the course of one week, frantically trying my best to cover as much ground within a short period of time. Malaysians, I included, are some serious foodies who not only enjoy the local offerings but also obsess about them and plan their daily lives around the meals. With such gastronomic delights that abound in this part of the world, no wonder food is in the forefront of their mind. By what you have just seen and read in this blog, I think you can understand why.